Video: Unseen footage from the siege of the greek parliament by tens of thousands of people, during the discussion and vote for the second packet of austerity measures, that took place between 10 and 12 February 2012, signifying the last great street battle (consisting of a crowd of more than half a million) of the people of Athens against the slow death of middle and poorer classes. 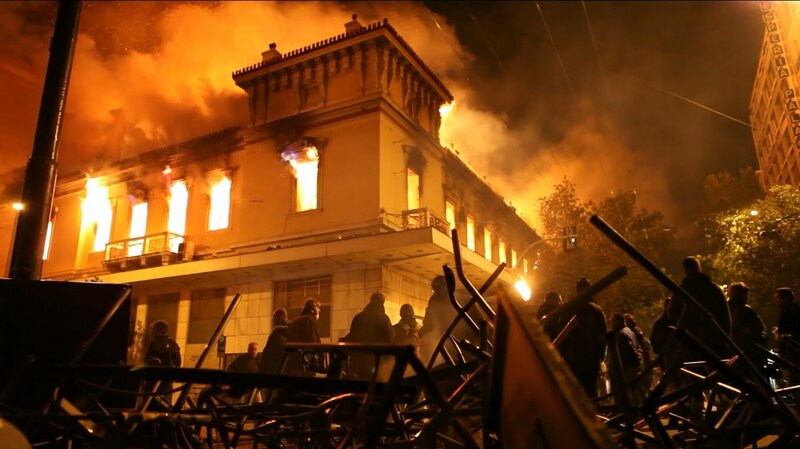 Image: Athens, Greece on February 12, 2012. Since then constant electoral processes and change of governments has fed people with the continuous false hope that their lives may change through voting, and as with all electoral process the angst of people is being kept dormant, only to be replaced by the depressive feeling of futility to act or react any more, because they keep entrusting their lives to politicians instead of self-organizing in a collective manner. This footage is important because Syntagma Square in front of the greek parliament was the epicenter of the battle in the way that it was the focal people where tens of thousands of people were trying to take over from the riot police. Not to many people have seen this footage of where they were trying to get because after the initial brutal and unprovoked attacks by the riot police in the Constitution Sq. (Syntagma Sq.) a little bit after 18:00, they simply refused to evacuate the city centre by force and flooded all the main and smaller streets around the Square (streets like Ermou, K. Serbia, Mitropoleos and the nearby squares of Monastiraki and Mitropoli). Each time these “rivers” of people attempted to approach the Syntagma Sq. in front of the parliament they suffered successive attacks by scores of riot policemen with asphyxiating gas and flash-noise grenades. It was amazing that the people stood their ground and refused to leave, while for at least 2 hours they were regrouping and attempting to approach the parliament again and again and again. At the same time people with smartphones or radios were informing the crowd that the greek mass media were falsely reporting that the demonstrators were just a handful and even the last few were leaving the area, pointing to the people that can be seen in this video on the square, where dozens of tv crews from Greece and abroad had their cameras providing live coverage. Some people laughed, some others got frustrated and angry by that fact, while realizing that the Police purpose was not to let people gather outside the parliament, because that was where all the TV cameras were positioned. It was to deter others to come and join the protesters.